We just finished our humongous review units in both Algebra 1 and Algebra 2. Algebra 2 had 9 skills. Algebra 1 had 8 skills. Note to self: Review units are a great idea to get student accustomed to SBG and the A/B/Not Yet Grading System. Further note to self: making the review unit this big was a big mistake. It's taken forever for the 2-week deadline to set in to force students to fix their "not yets." This means I currently have students who have not made an A or a B on a single quiz. This is not good. And, their grade still doesn't reflect it. Next year: 4 or 5 review skills in the review unit. Then, spread the other review skills out in the unit the are actually needed for. To encourage students to come in for extra help, I typed up an "invitation" to spend time before school, after school, or at lunch with me. It's actually not an invitation, but a mandate. Invitation sounds nicer, though. I printed them off on green paper and filled in the top three lines. I passed them back with graded quizzes. I think this was a wake-up call for my students. Ideally, they would be keeping track of this themselves or be checking our online gradebook. They do have a score tracking sheet in their notebook, but I'm having trouble motivating some of my students to use it. I gave this invite to all students who had more than 3 not yets to fix. Students signed and returned these. 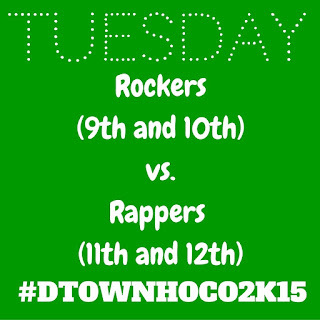 We'll see how many actually show up. It's at the point where I should be calling parents, but I don't have time to call THIS many parents. Note to self: Start handing these out WAAAAAAAAAAAAAAAY sooner next year. Don't assume students will realize they need help and seek it out themselves. I feel like this post has been pretty negative since I'm focusing on things I should change. So, I want to end with a positive. Having students self-assess at the end of the quiz has been amazing. 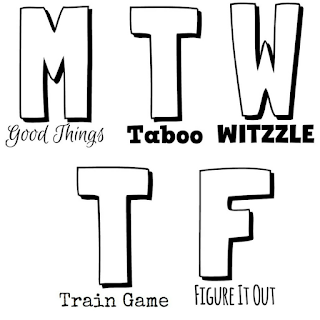 Last Friday, I pulled a new-to-me brain teaser out for Figure It Out! Friday. I found a puzzle called "Make It Even" in The Moscow Puzzles: 359 Mathematical Recreations by Boris A. Kordemsky. The book is published by Dover, so it's super affordable at $3.99! I've found numerous puzzles I want to try out with my students. This is the second week in a row that our figure it out puzzle has come from this book! The original puzzle called for 16 objects. 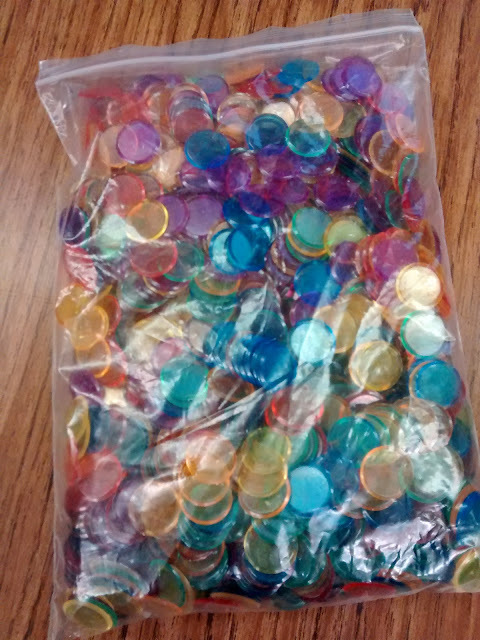 I decided to use bingo chips since I have a giant bag. 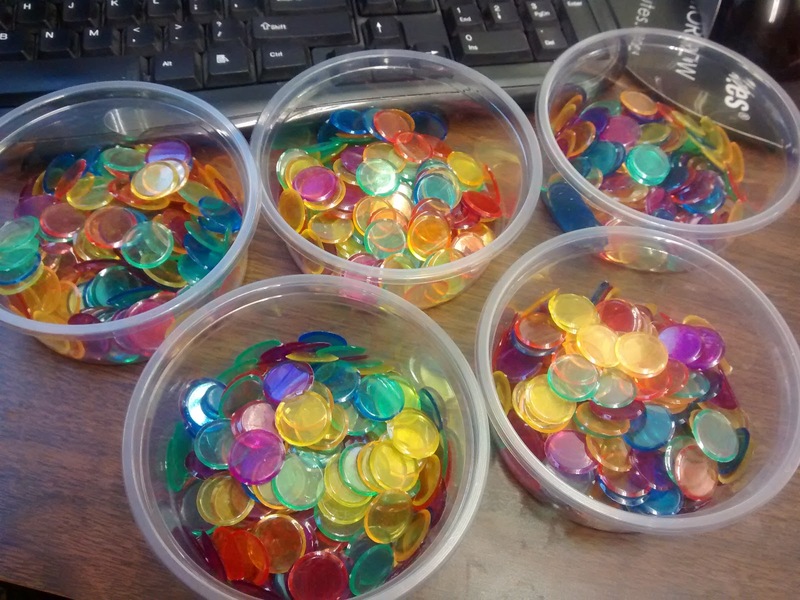 To save time and not have to bag up 16 bingo chips per student, I took a package of 5 plastic bowls I bought at Dollar Tree for $1 and divided the bingo chips into these bowls. The bowls are cheap feeling, but at $0.20/piece they are amazing! Here they are, stacked and ready to go. My Algebra 2 students and Stats students were much better at reading the instructions and attempting the puzzle on their own. My Algebra 1 students struggled even when I read the instructions to them. There were a ton of "This is too hard" or "This is impossible" comments. In each class, at least one student figured it out though! 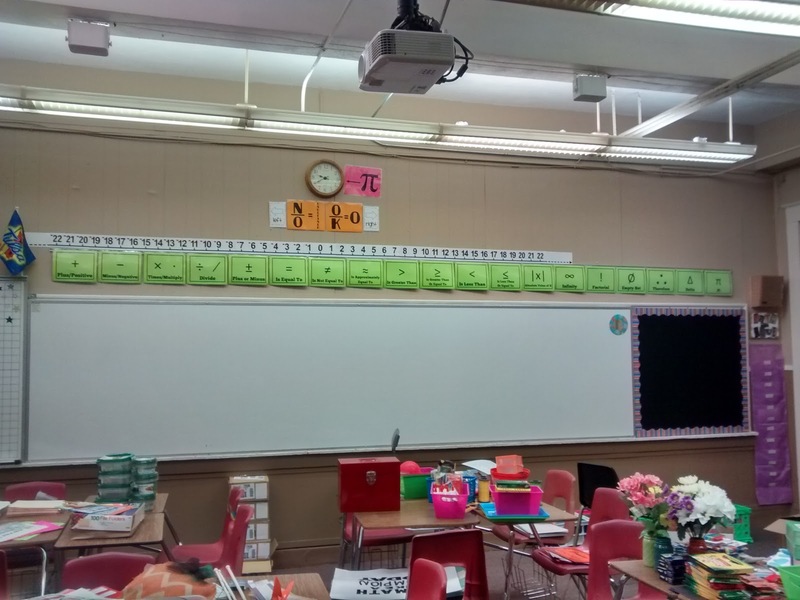 I can't tell you how many times a student would raise their hand to have me check their solution, and I would walk over to find that they had a column or row with one in it. I think they were just too focused on making the rows even or making the columns even to even look at it the other way. Part of me now wonders if students would perform differently on this task if it was presented differently. Maybe like this? Some of my students tried rearranging the 10 leftover chips into 2 rows of 5. I think this second phrasing of the problem would prevent that. If I did the second version, I'd definitely give it to my kids inside a dry erase sleeve. 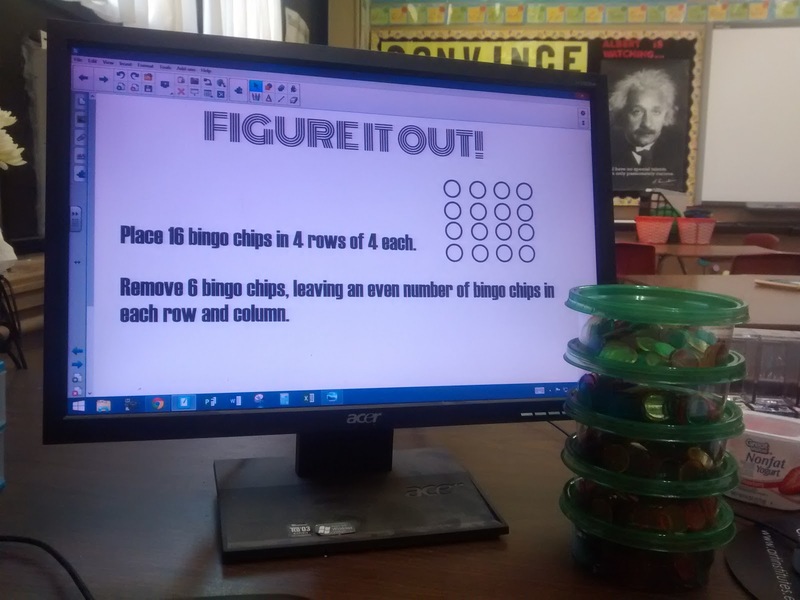 Or, maybe combine the two methods and give students the grid and only 10 chips? 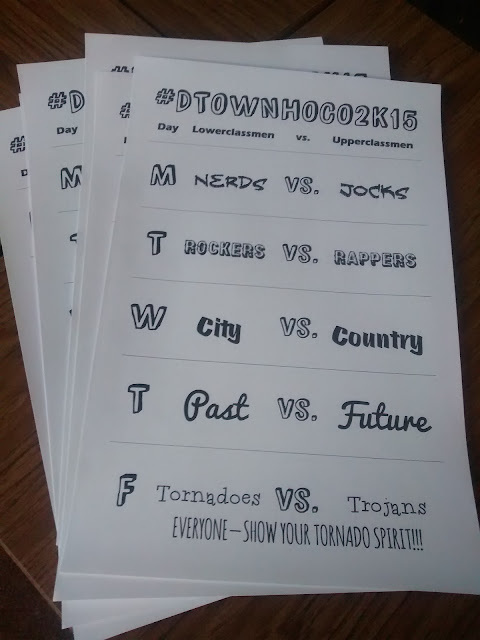 My student council kiddos are always looking online for homecoming ideas from other schools, so I feel compelled to post our spirit days to help others out. 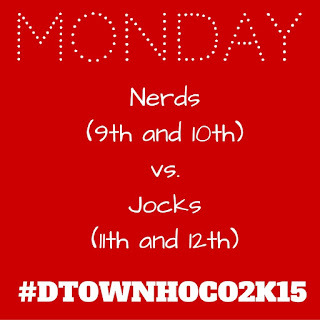 We took the general idea for this week from another school and modified it to fit our student body. 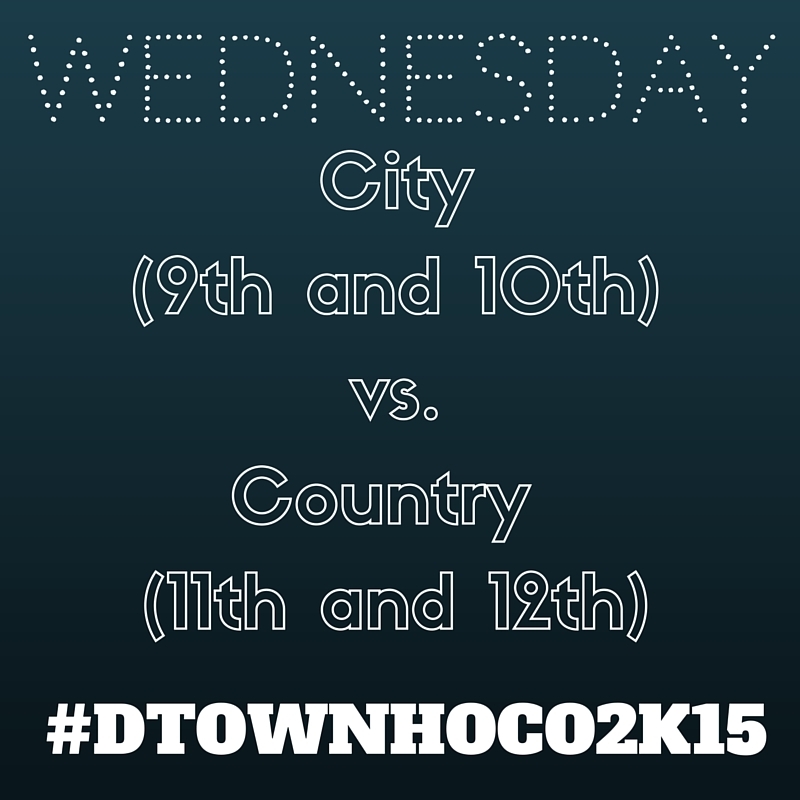 This year, we decided to do a "Versus" week. 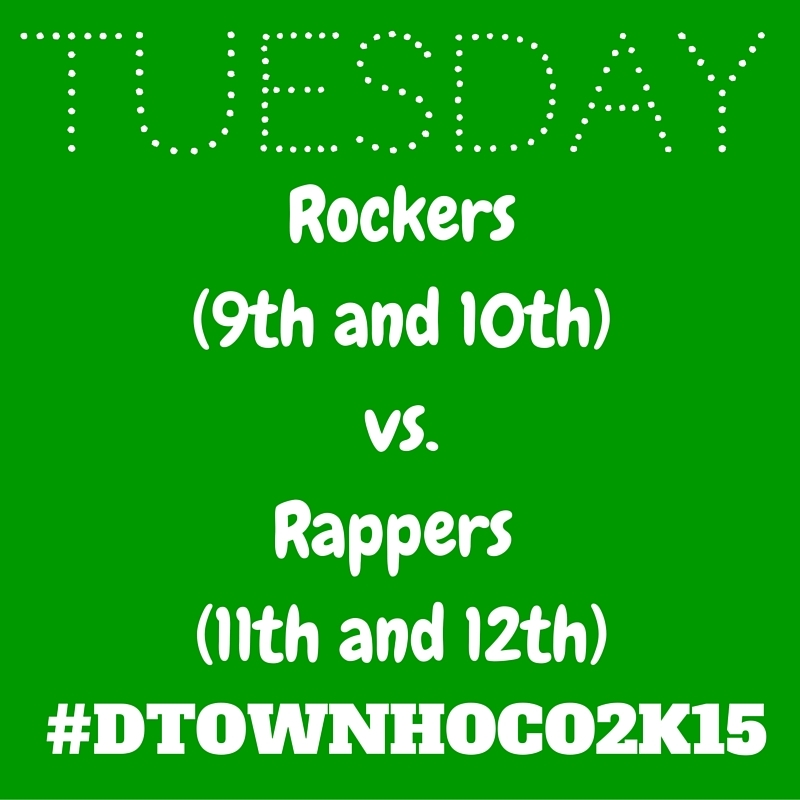 Each day, we pitted the lower classmen against the upperclassmen to see who could come up with the best costumes. I typed up the days and printed them on 11 x 17 card stock. 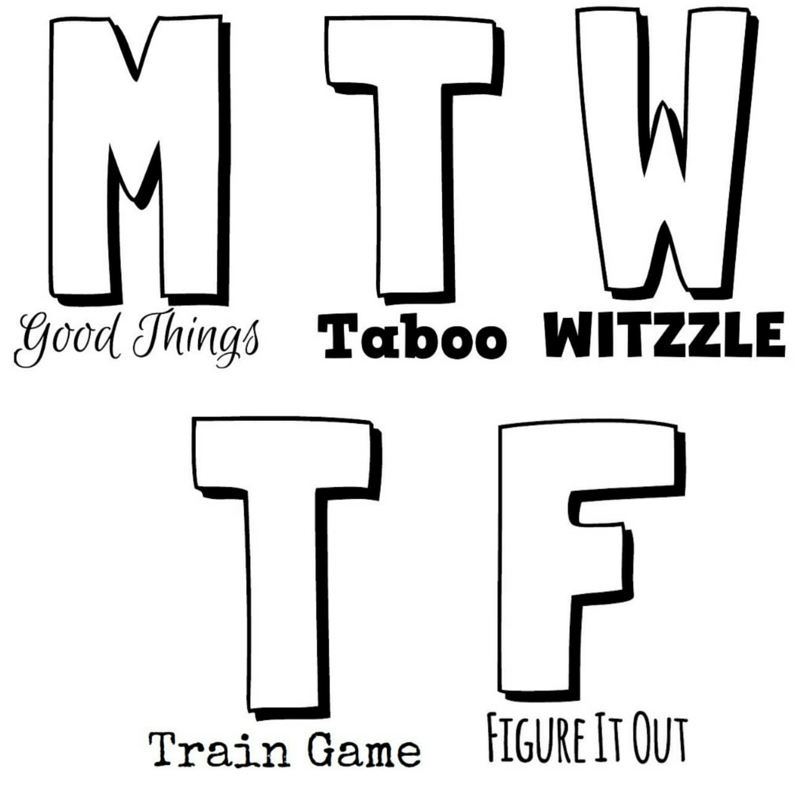 I decided to try something new this year and design an image for each day of the week for students to share on social media. 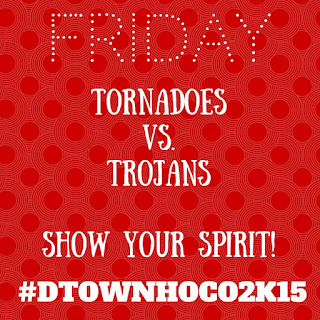 I sent it out to my student council kids via Remind. I don't know how many of them actually shared the image, but I hope some of them did. At least, I had a lot of fun making these using Canva! 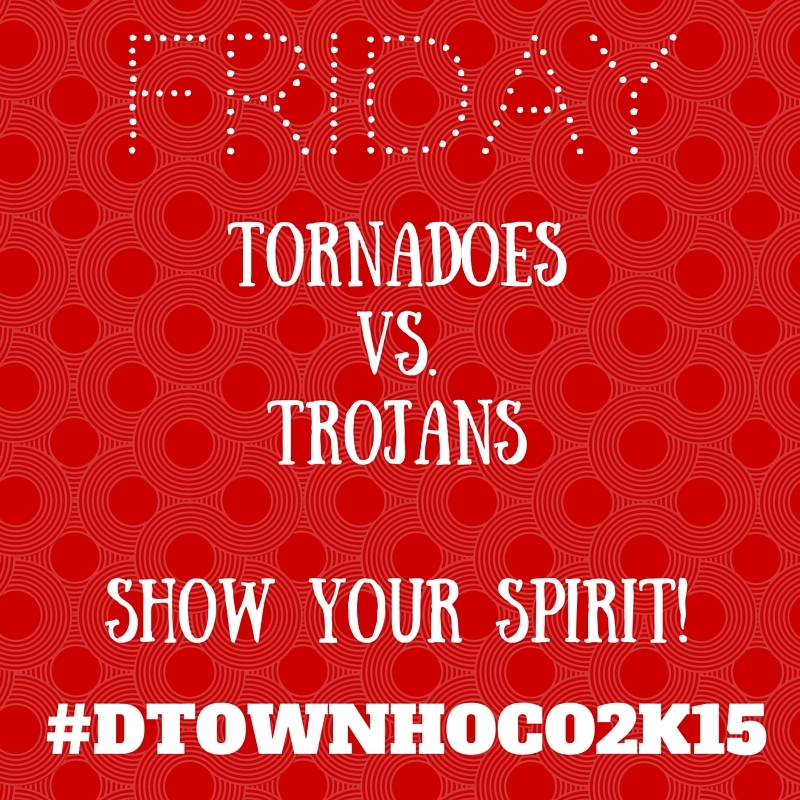 Homecoming ended up being cancelled due to a thunderstorm which was a bit frustrating. It got cancelled last year, too, due to the other school not having enough players to make a team. It's hard to watch my kids work so hard on something and it end up falling through. 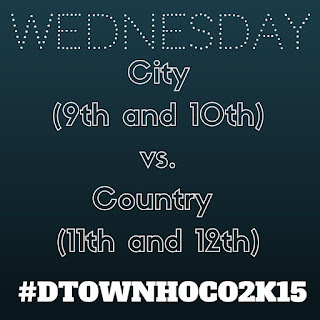 Our homecoming t-shirts turned out fab looking, though! Our design company always does such a good job. 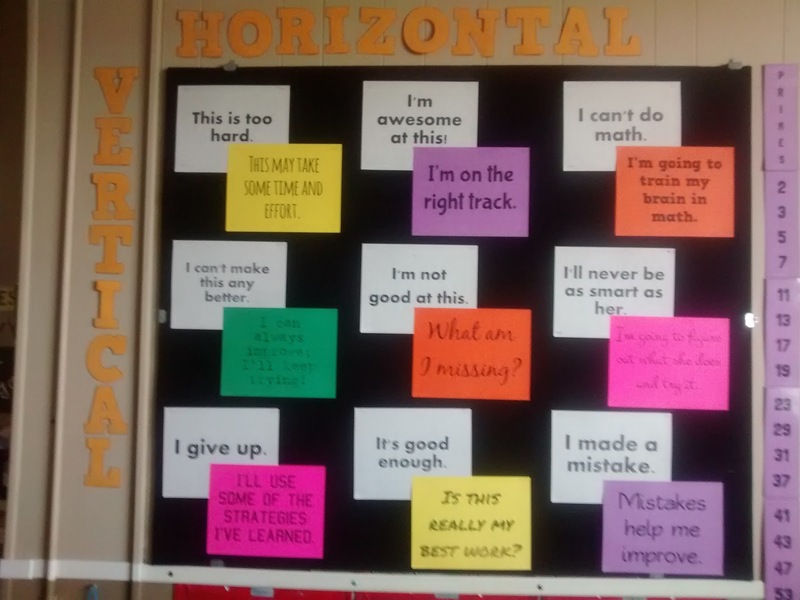 A few weeks ago, a student mentioned that she missed the bulletin board from last year with the different statements on it. I saved this bulletin board for last to take down at the end of last year. It's been the most impactful bulletin board of my teaching career. It wasn't just pretty. 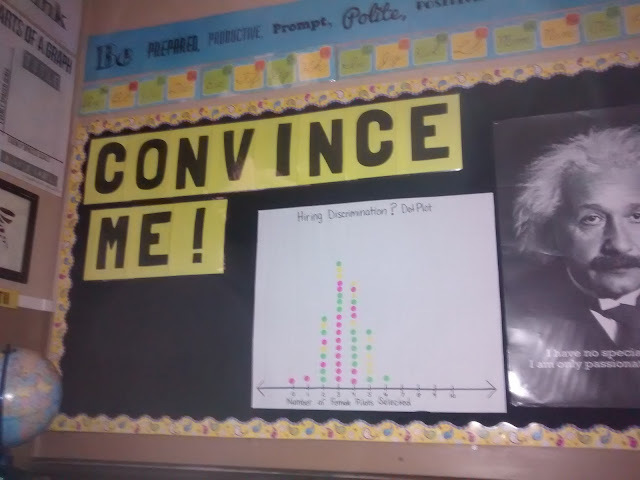 It made a difference in my classroom. I used it to correct my students. And, my students use it to correct me and each other. It made us think about our words. It made us reflect on what those words were saying about us and our attitude at the moment. Yet, I'm the type of person who likes to change things up every year. So, the bulletin board came down. 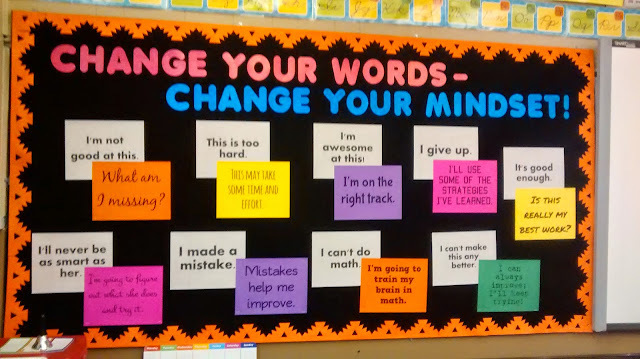 And, I put "make a new growth mindset bulletin board" on my summer to do list. I looked for something I liked better, but I never found anything. Classroom drama meant that I didn't get into my classroom to decorate until a week before school started. Students arrived, and my bulletin boards were still blank. As I taught classes, I found myself increasingly frustrated. One of my freshmen would announce "This is too hard!" I just wanted to point to the bulletin board and say "This will take some time and effort." The same sentence I said so many times last year. I found myself still saying this, but it didn't have the same impact. 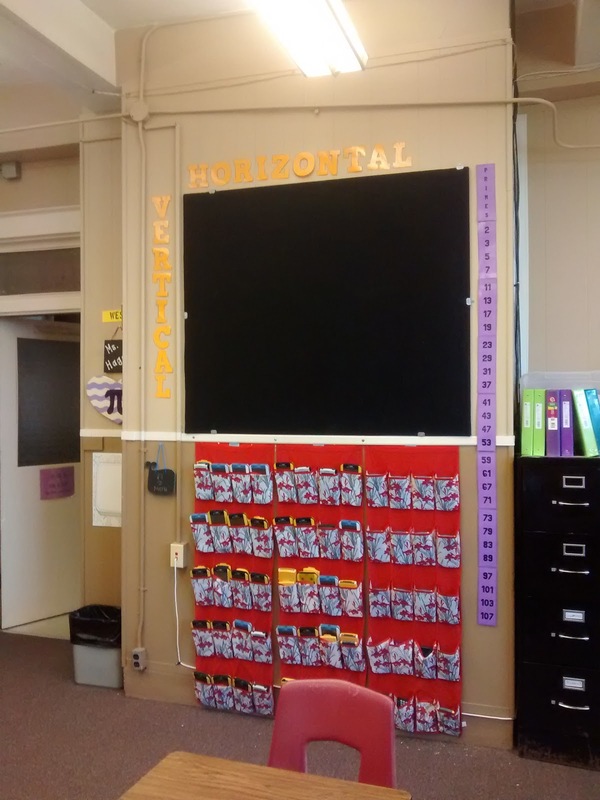 As other teachers decorated their classroom, they kept tagging me on twitter with pictures of their new, beautiful bulletin boards. I was happy for them and sad for myself, all at the same time. Friday, I started looking at my last blank bulletin board. I still had the posters from last year's bulletin board. The question was - would they fit in this smaller space? I got my last period aide to staple as many of them up as possible. All nine of them fit! There's no room for the title, but I can live with this. My classroom just feels so much more complete now. Want the file to put this up in your own room? Check out this blog post. After my recent post on practicing fraction operations with a question stack, several commenters asked how exactly I reviewed fractions with my students. Now, keep in mind that I'm teaching this to Algebra 2 students. I'm focusing on the algorithms for working with fractions - not conceptual understanding. I'd love to take the time to do more, but we've got more than enough stuff to cover in Algebra 2. I need my kiddos to not freak out if there is a fraction in a problem. I need my kids to not freak out when we start working with rational expressions soon. I reviewed this topic with my Algebra 1 students a few weeks earlier. I had them write out most of the notes by hand. It was slow. Painstakingly slow. And, some of my students couldn't even read the notes when we were done because their handwriting is so messy. I really liked the ordering of topics, so I kept that. But, I changed it to have much less writing. This was also good because I wanted to spend as little time as possible on fraction review. Then, I decided to review two things that I get students asking about a lot. How do you make an integer into a fraction? And, is -a/b and a/-b the same thing??? The next section, equivalent fractions, has been a game changer in my classroom this year. I gave them the green boxes and asked them to figure out how to make an equivalent fraction. This seemed super easy. It should have since we're in high school. 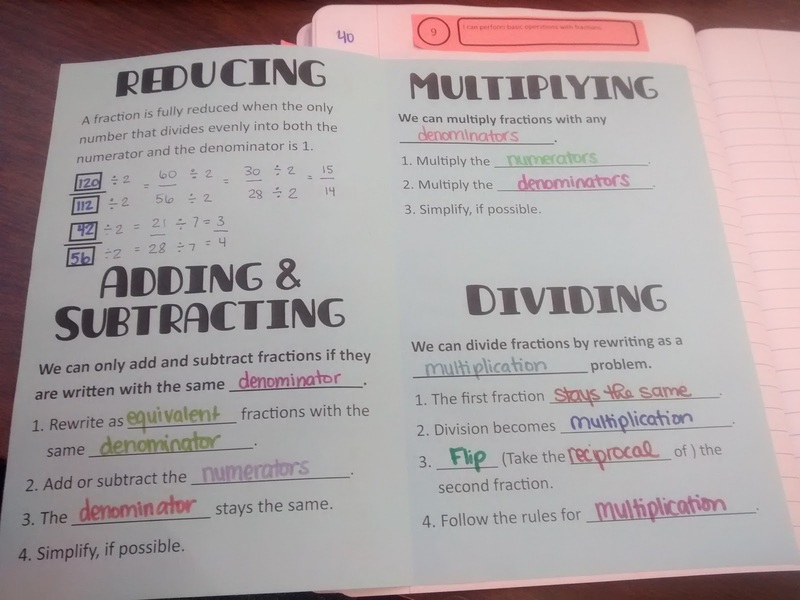 A quick review of reducing fractions. 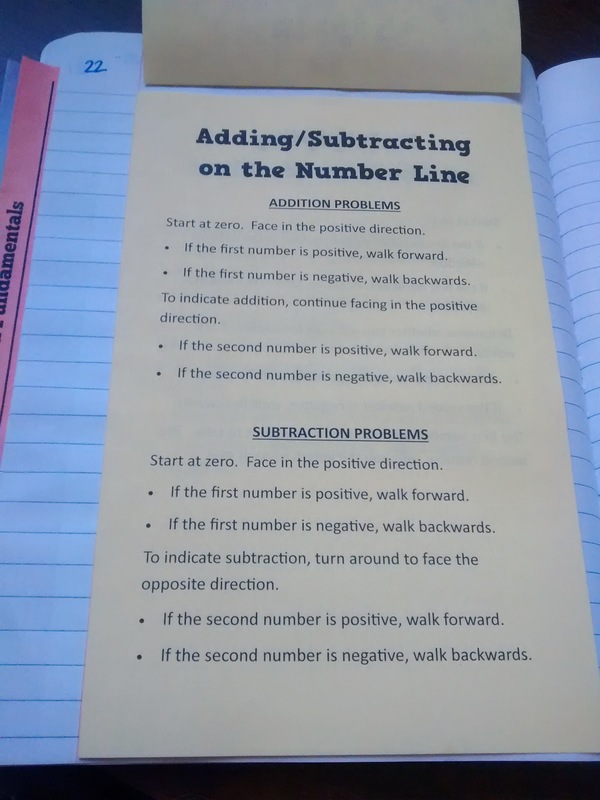 Then, notes on adding/subtracting fractions. In the past, I would just tell them to get a common denominator. Too often, students would find a new denominator and leave all the numerators the same. I could never figure out why they would do this. 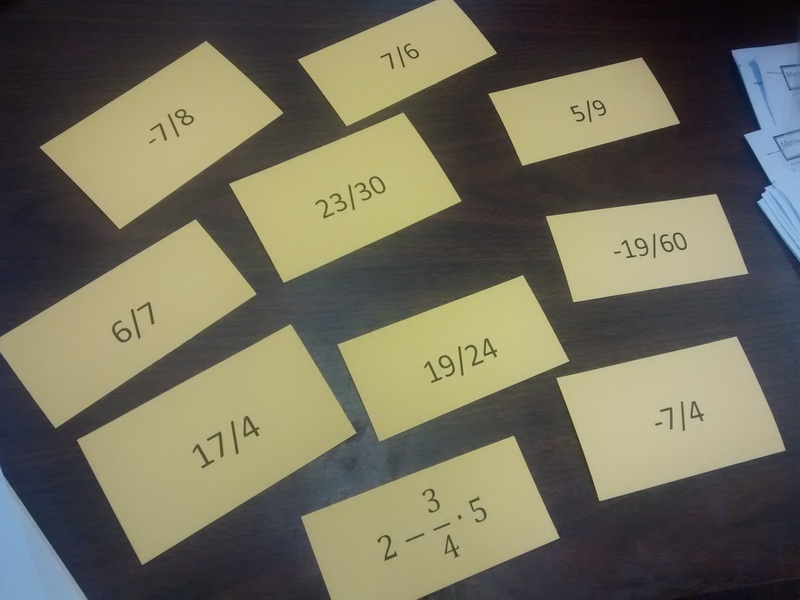 This time, though, I connected it to the idea of equivalent fractions we had just gone over. I had really emphasized that whatever we do to the numerator, we have to do to the denominator. It worked wonders! I'd always just assumed that kids could find common denominators. This is the first time I've explicitly taught/demonstrated how to do this to my students. And, I think this is making a huge difference. 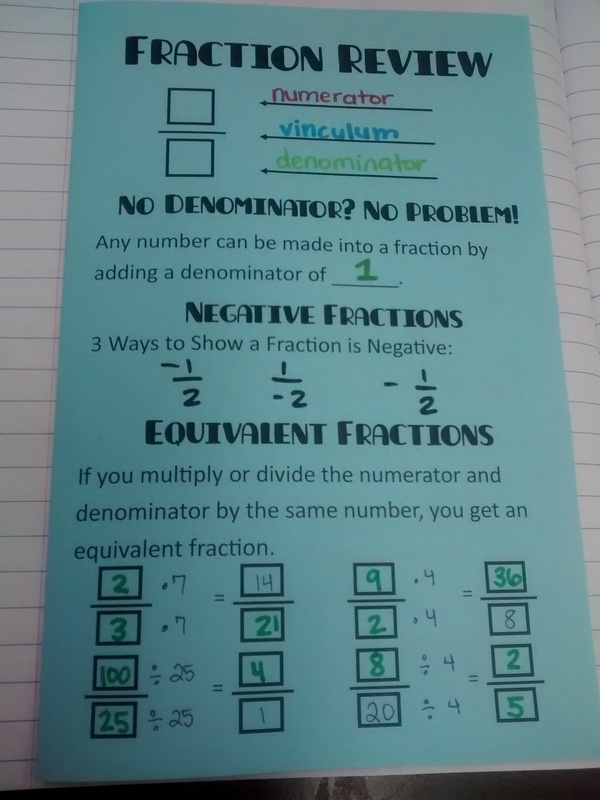 To help them remember that they only add/subtract the numerators and keep the denominator the same, I said "We worked really, really hard to get equivalent fractions with that denominator. Let's keep it that way!" My multiplication and division notes were pretty straight forward. Nothing super interesting there. The most common mistake was students trying to cross multiply. All the time. For some reason, they just see fractions and want to cross multiply. I told them we're never going to cross multiply this year. We put four practice problems in our notes. And, the next day we did the question stack activity with individual white boards. Want the file? I've uploaded here it as an editable Publisher file and a non-editable PDF file. The other day on Twitter, I saw this idea posted. I embedded the tweet, so you may have to wait a moment for it to load. 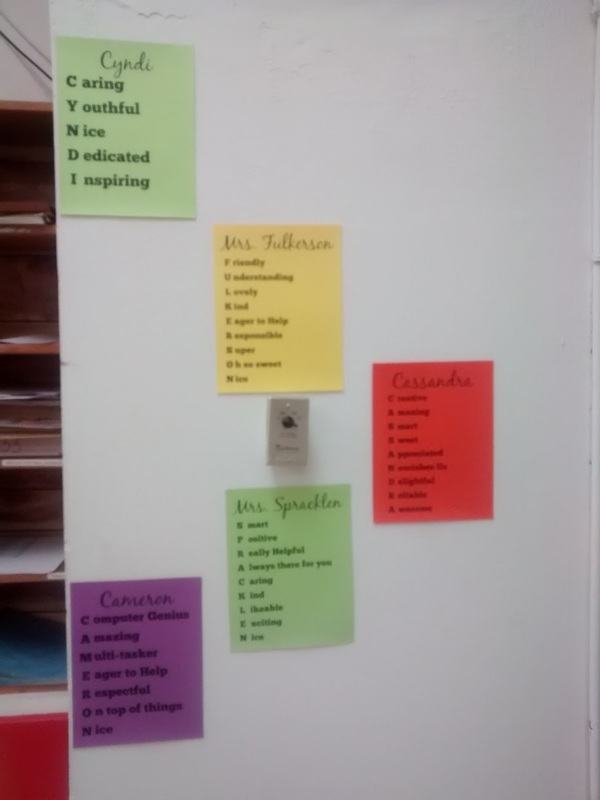 While you're waiting, it's a picture of acrostic poems in the teacher's lounge with adjectives to describe each staff member. I saw this idea and immediately decided it would be the perfect project for my student council kids. 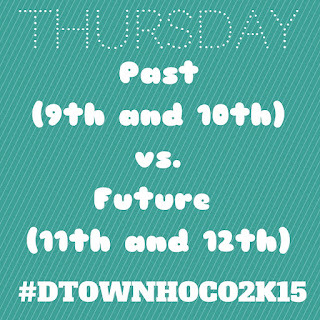 I took a screenshot of the idea and sent it to my StuCo kids via Remind. 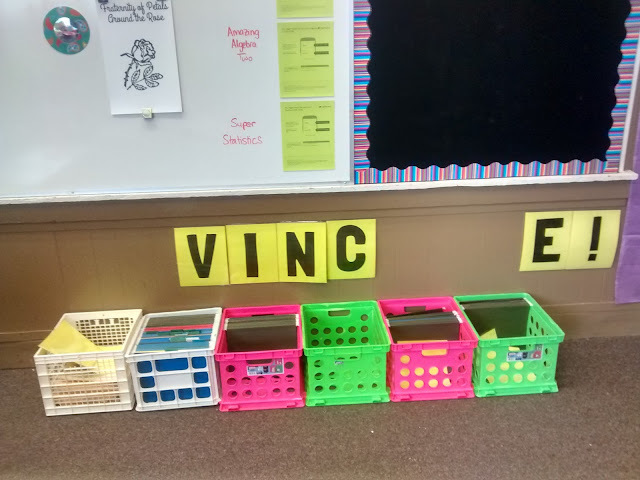 At our next meeting, I had printed out each teacher's name. The kids broke up the teacher names and started coming up with descriptive words. Over the course of two lunchtime meetings, we wrote adjectives for each letter. A lot of teachers had a "Y" in their name. Have you ever tried to come up with a positive adjective that begins with a "Y?" Not easy. Today, I printed them off on card stock with pretty fonts and hung them up in the teacher's lounge. There are 22 total. This includes all of our teachers, principal, counselor, secretary, custodian, Indian Education department, and lunch ladies. I haven't got the reaction of the teachers yet, but I hope it puts a smile on their face when they walk into the teacher's lounge. I started running our of room to hang them and had to get kinda creative. Some times lessons go really well. Sometimes they totally flop. Today, I had both of those happen in Algebra 2. Now, they did happen in different class periods. Yesterday, we did a fast and furious review of fraction operations. I usually do this write before we jump into rational functions, but I'm including a review unit this year. And, I decided to put it there. 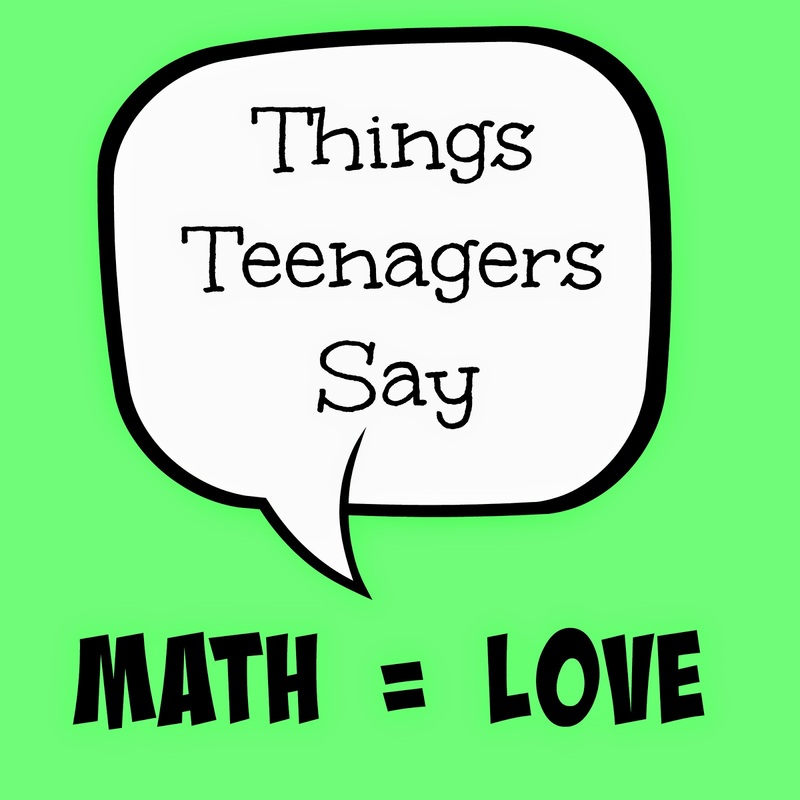 This is our last review topic of the year before jumping straight into the nitty gritty of Algebra 2. The point of the review unit is to get all my students on the same page and to get them used to my SBG system before we start learning new material. Two years ago, I did a normal distribution activity with my stats kiddos. I decided I loved the practice structure, and I wanted to modify it for my algebra classes. The idea is that you have cards. One side has a question. The other side has the answer to another question. 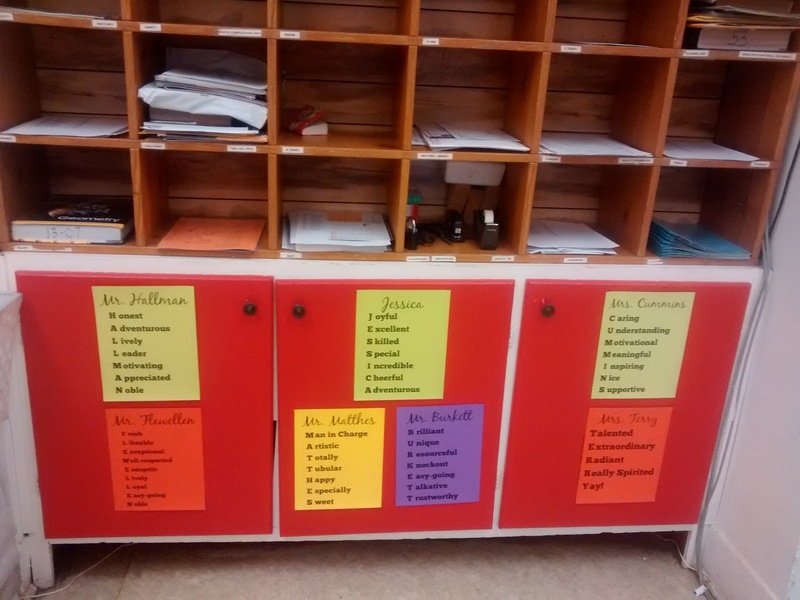 Students put all the answer cards facing up. Turn over one card. Solve this problem on your dry erase board. Find the answer card. Flip it over. This is your new question. Keep repeating until the cards make a loop. Last year, I made a set of quadratic formula cards to do with this activity on the day NPR visited my classroom. I hand wrote them, so there really wasn't any resource to blog for them. Since then, I'd sort of forgotten about this activity. I like it because kids are working in groups. I like it because it's self-checking. If they don't get an answer that's on one of the cards, they have to work together to figure out their error. I like that I can circulate and help the groups that need it the most. The room gets a little loud, but it's almost all math talk. I love hearing kids explain their thinking to their tablemates. And, I love hearing them ask each other clarifying questions. It's also the perfect activity to use my red, yellow, and green cups with. Today, I wanted to give them some fraction practice questions for half of the period and then let them work on correcting Not Yet quizzes for the second half of the period. I left work yesterday not really knowing how I wanted to structure this practice. Last night, I decided to do one of these card activities that I saw called a "Question Stack" somewhere. I have first hour plan, so I made up some questions and typed up the cards in a hurry this morning. When the activity didn't work as I'd promised, their interest quickly dropped. They worked a bit, but I considered the lesson to be a flop. At lunch, I looked at the cards and realized I needed to switch my two columns of answers for them to print correctly. My second Algebra 2 class got theirs printed on boring, plain copy paper. But, they worked perfectly. I had to go around to each group individually and re-explain how the practice structure worked. But, they loved being able to check their work themselves and only ask for help when their entire group was confused. This is the most math I've ever heard these students talk. The kids told me that they really liked doing questions like this and asked if we could do this more often. YES! It's been so fun to see some of these kids "get" fractions for the first time in their lives. One student said I was officially his favorite math teacher ever because no one had ever been able to explain fractions to him before. 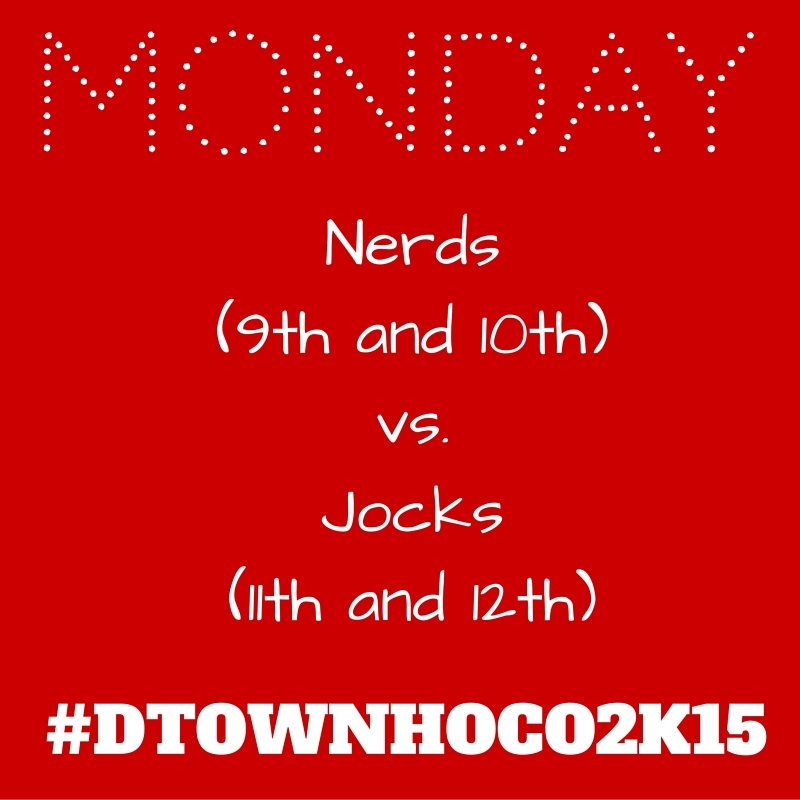 One good thing about #Teach180? I'm tweeting every day. I'm checking twitter every day. 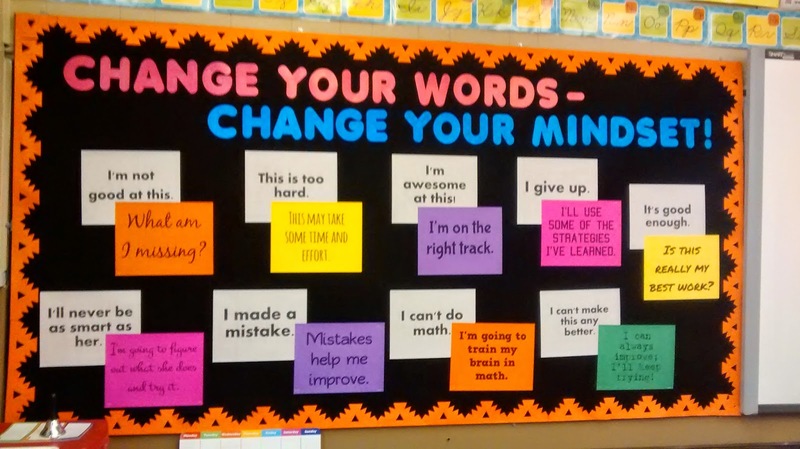 I'm seeing new ideas to apply in my classroom every day. And, the more I am involved on twitter, the more involved I feel in the MTBoS. One bad thing about #Teach180? I tweet about ideas long before I blog about them, then people go looking for them on my blog and can't find them. Sorry guys! I've received several e-mails in the past couple days asking for the calculator tutorials I tweeted. 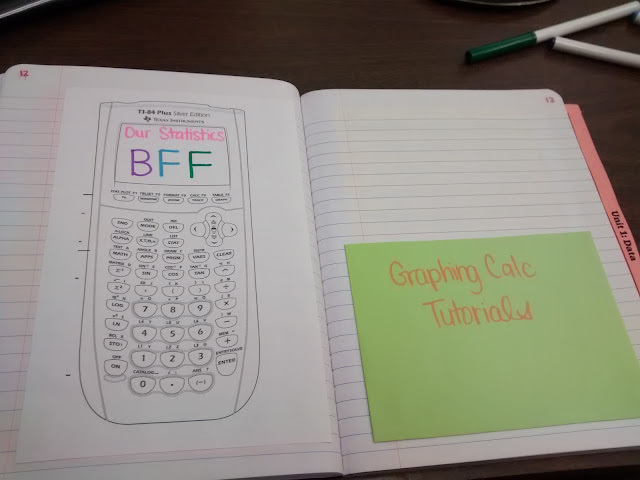 I had each of my classes glue in a copy of the calculator buttons and a pocket to hold calculator tutorials in the front of our notebooks in the resource section. 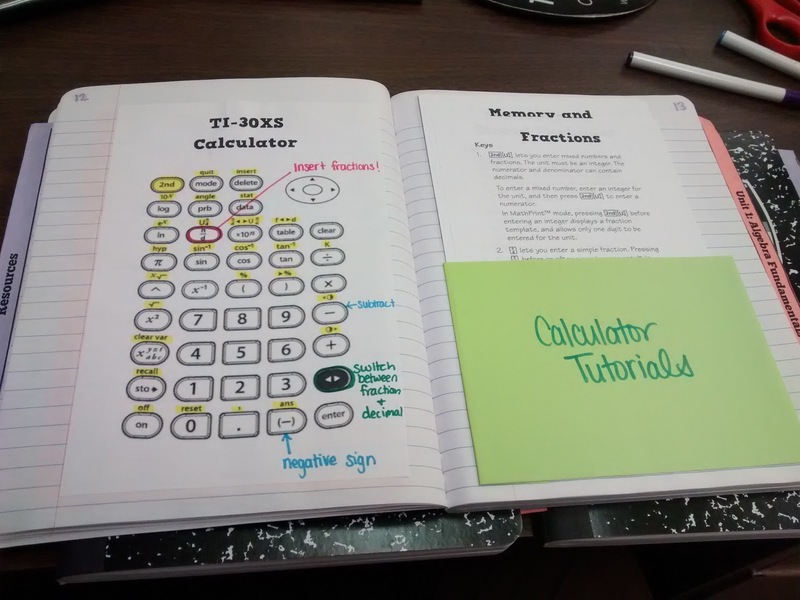 I took the TI-30XS tutorials from materials in Guide for Teachers posted by Texas Instruments. I formatted them to print 2 to a page. I'm taking my statistics tutorials from Stats: Modeling the World. I'm creating them as we go. For Algebra 2, I'll probably be making them myself, but we really haven't used the graphing calculator yet for anything but basic computation. That's by design. Last year, I introduced graphing on the calculator during week 1, and it went rather badly. We're building up to it this year! The TI-30XS calculator screen printable is in the same file as the calculator instruction pages I have made. Download it here. 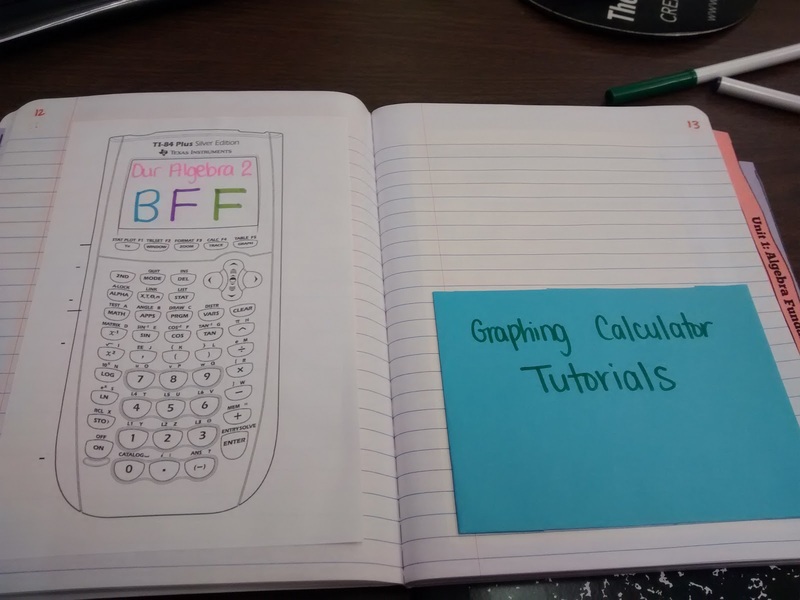 The TI-84 printable is designed to print 2 to a page. It can be downloaded here. As always, you can find all of my downloadable files here. Happy Tuesday! I decided today is the perfect day to round up the latest crazy things teenagers have said in my classroom. There's never a dull moment with them. Student: What is their meat made out of in Australia? Student: Well, I don't know if they have cows. So, I thought they might make their beef out of something else. Ms. Hagan is cooler than you. Don't mouth her! Do you have a separate credit card just for buying cat food? I like to live dangerously. I play the Wii without the safety strap. My life goal is to staple pudding to a tree. Me: Is that a normal thing to do? Student: Yes. Are you telling me you've never done that? Me: I actually can't blow a bubble with gum. Me: It's okay. I don't actually like gum. Student: You don't like gum?!? That's like saying you don't like meat. Student: Don't tell me that you're one of those vegan people! Me: Well, I can tell you that I'm not vegan. But, I am a vegetarian. 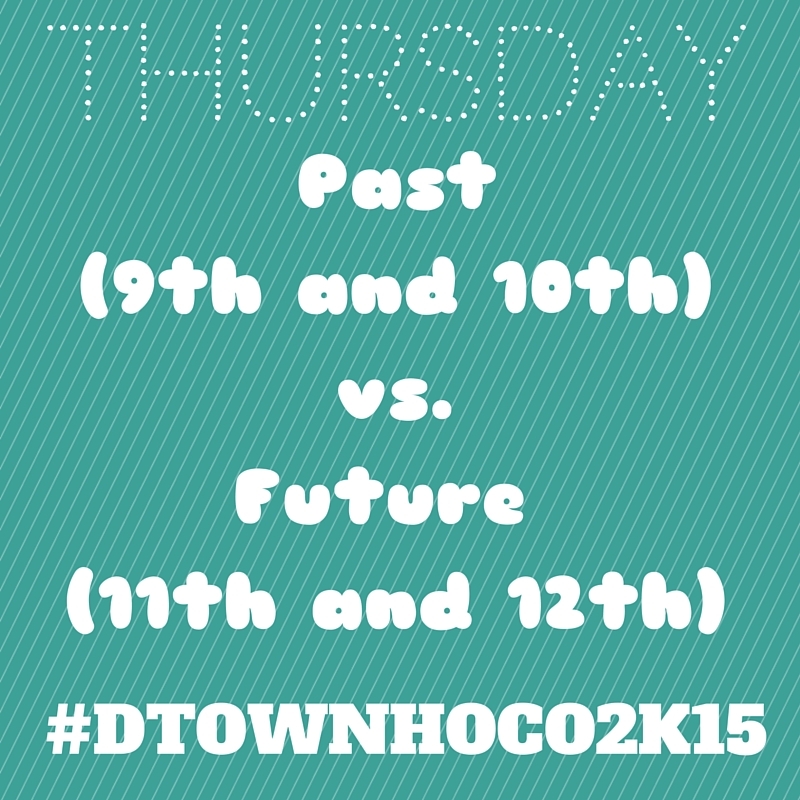 For one of our Homecoming Spirit Days, we had Past vs. Future as the theme. Many students came to class dressed as babies. One girl even went as far as to wear an adult diaper on the outside of her clothing. Student: I need to change my diaper. It ripped. Student: But, I can't just throw my diaper in your trash can. It would look weird if there was a diaper in your trash. Me: There's a trash can in the hall. You could throw it away out there. Student: But, that would be weird if someone saw me throwing away a diaper in the hall. Me: I don't know what to tell you then. I've never had this problem before. Student: I'll put it in a Sonic bag in your trash so it doesn't look weird. Me: Everyday is a good day to do math! Student: You need some hamburger or something in your life. Then, maybe you wouldn't think like that. Ms. Hagan, your hair is on my paper. Student: Can I ask you a question? Another Student: Wow, we didn't think you'd have the courage to go through with that. Me: I am so confused. A third student: It's a vine. Me: That explains it. I don't understand what your generation's obsession with vines is, though. Third Student: You should really watch this one. They go up to a police officer and point at his shoes because they are weird looking. Me: Oh, does that mean you think my shoes are weird looking? I. Am. Offended. Student: Shut up, guys. You're going to get me in trouble. 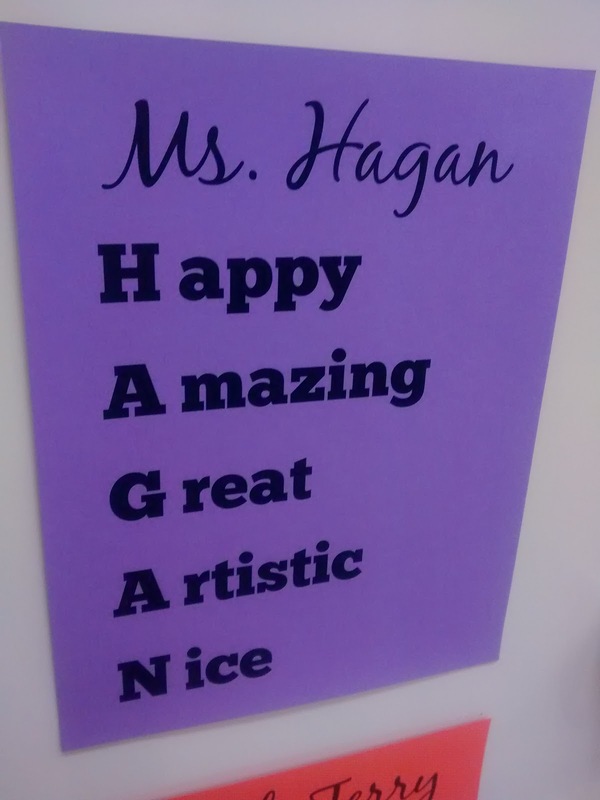 I think your shoes look just fine, Ms. Hagan. Student: Oh my goodness, guys. She's wearing Crocs. Why didn't you say Crocs when I asked you what you were wearing? That would have been epic. Me: Mathematicians have nightmares about having radicals left in the denominator. Student: I know what my Halloween costume is going to be now. I am going to dress up as 2/Radical 7. Because Ms. Hagan is a vegan, she will never experience the pleasure of eating a burger in the bathroom. If I was a goat, could I still be in this class? One student to another: I'm going to knock the slope out of you. That's a math threat! Student: Guys, I saved a life today! There was a big truck coming up the hill. So, I grabbed a turtle out of the road and put it in some random person's yard. I took them down and added more packing tape. They still fell down! Finally, I decided to take one of my empty bulletin boards and staple them up. I accidentally stapled the N's upside down. But, it would be too much of a hassle to take them all down and fix it. So, I'm living with it. For now. Students often question me about the way I run my classroom. Why do we have to show all of our work? What if I can do it all in my head? That's great. But, I need you to show me what that head of yours is thinking. Convince me that you know what you're doing and didn't just accidentally get it right. Or, they ask me why I gave them a "Not Yet." Because you haven't convinced me that you know how to do these problems yet. They are always frustrated with this response, but I'm not giving up. I think this is the first time many of my students have been asked to practice to mastery. They are used to being allowed to move on without mastering the content. That's not going to help them pass their Algebra 1 EOI. That's not going to help them graduate from high school. That's not going to help them learn math. I probably should have put that last reason first, but it's the reason that means the least to my students. I can't convince them (yet) that math is important. But, most will agree that graduating is something they want to do. Though,there are always the few who tell me that a high school diploma isn't necessary. I really haven't figured out how to show students that. No matter what I say, they always seem to know someone who has excelled despite having a diploma. First, a letter. Then, actual classroom stuff. Thank you! Thank you for inspiring me to become a math teacher. I always wanted to be a teacher, but you showed me just how fun teaching math could be. Thank you for helping me survive my student teaching experience. Thanks for encouraging me through year one. And year two. And year three. And, now, year four. You've answered my questions. You've helped me keep my sanity. I've stolen more ideas from you than I can count. If it's happened in my classroom, there's a 99.5% chance the idea came from one of you. Thank you for allowing me to meet my amazing fiance. You guys aren't my "internet friends" anymore. You're friends. Plain and simple. And, thanks for helping me make it through grad school. For my most recent class, I had to plan a hands-on unit that was composed of multiple, linked learning cycles. This sounded daunting until I started stringing together stacking cups, barbie bungee, and tying knots! You've taught me so much more than any master's program ever could. MTBoS, you've truly changed my life! Now, let's talk some more grad school. 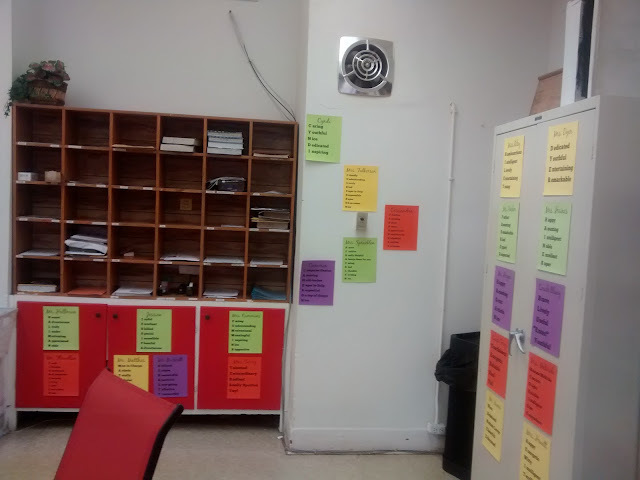 I just finished implementing my action research project in my classroom. The topic of my project is remediating integer operations. We all know how important it is for students to be able to work with positive and negative numbers in algebra and beyond. When students come in our classrooms lacking these skills, it impacts their performance on a daily basis. Disclaimer: I don't wholly embraced timed tests. 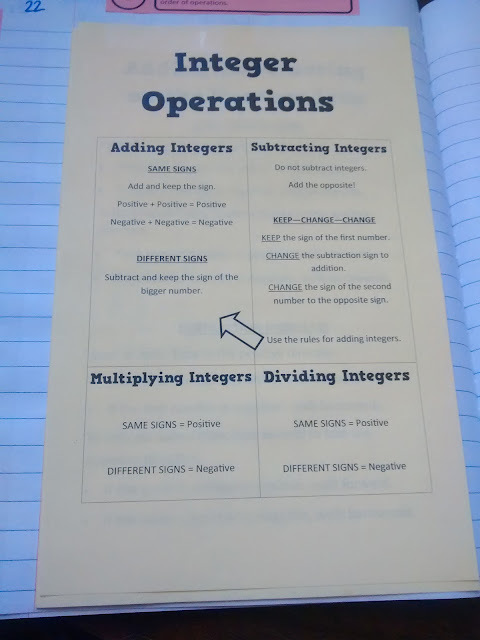 But, when you're trying to measure accuracy and fluency with integer operations from a large number of students on a regular basis, you do what you have to do. Have parents sign a permission slip. I did this project with all of my Algebra 1 and Algebra 2 students. Give students a pre-test. 50 integer operations questions. 5 minutes. Grade pre-tests. Input scores in excel. Sort scores from highest to lowest. Take the top two students. Randomly assign the first student to one of two treatment groups. Place the second student in the other group. Take the next two students. Randomly assign the first to one of the groups. Place the second student in the other group. Repeat until all students are assigned to a group. 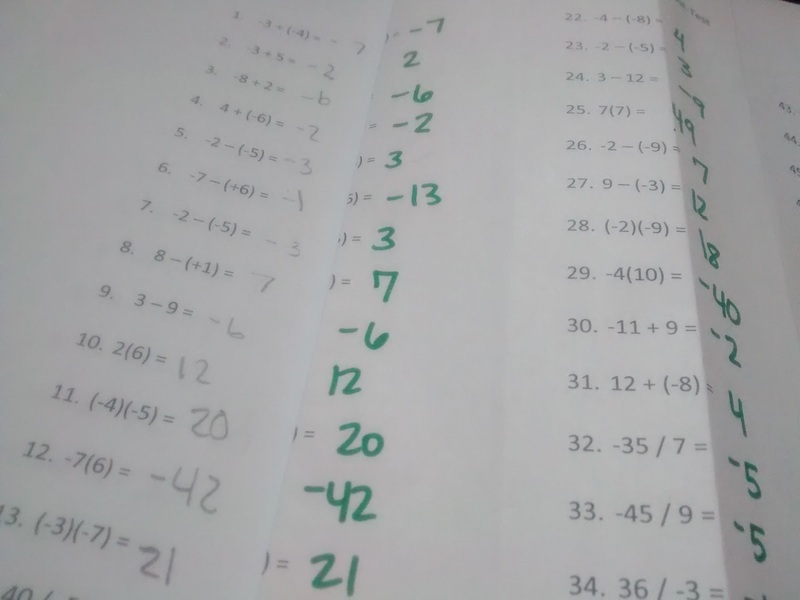 I had my student aide help me grade a lot of these integer tests. Her mind was blown when I folded over the answer key to make grading easier! 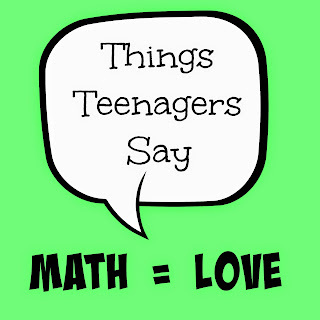 Give students a survey to help measure their attitude toward math. Hope this comes in handy when you write up your findings. Prepare 2 different sets of notes. One set for each group. 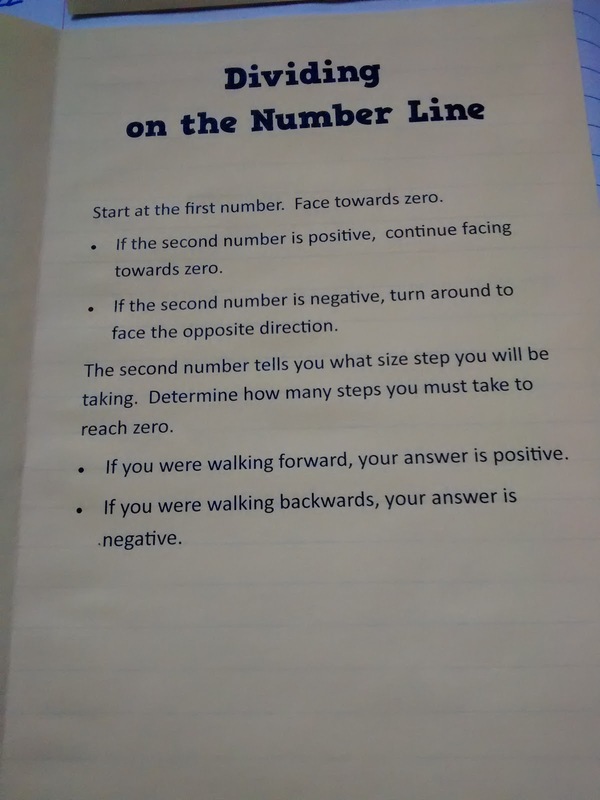 Group 2: Number Lines - These were adapted from a resource I found online and have subsequently lost. The notes featured printable pi shaped playing pieces to practice adding/subtracting on the number line. I wrote my own notes for multiplication/division because I couldn't find any that focused on number lines. 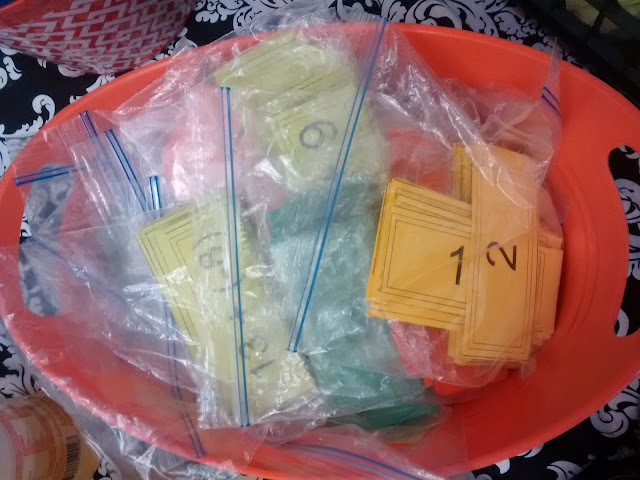 Students in the second group also got a number line and a bingo chip with an arrow drawn on it. My project requirements meant that students in each class period needed to be in each treatment group. Therefore, whole-class remediation was out. The remediation process needed to be self-guided. Students also added a horizontal number line to their interactive notebooks. I haven't actually glued mine in yet, so I can't take a picture of it. But, students were instructed to cut out the rectangles including x's. The remaining tab glues in the back cover of the composition notebook. 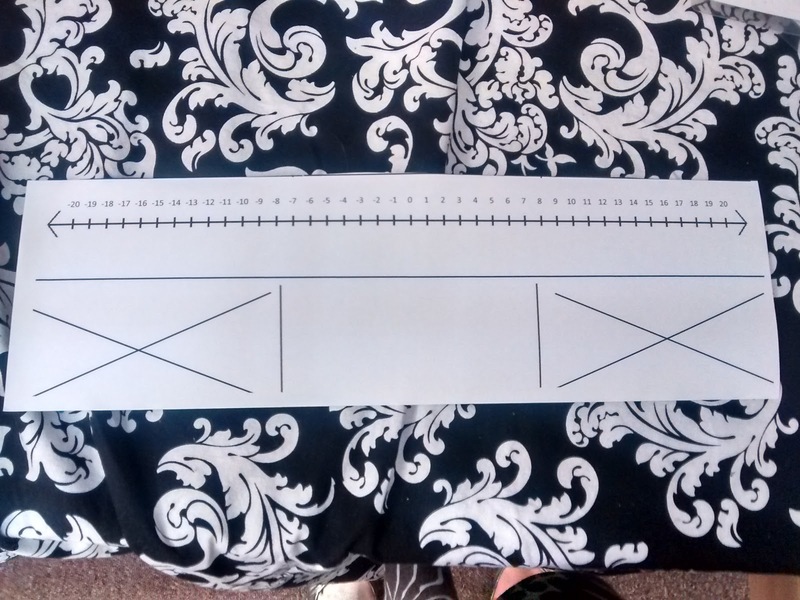 The number line then folds down and in to be hidden when not in use. 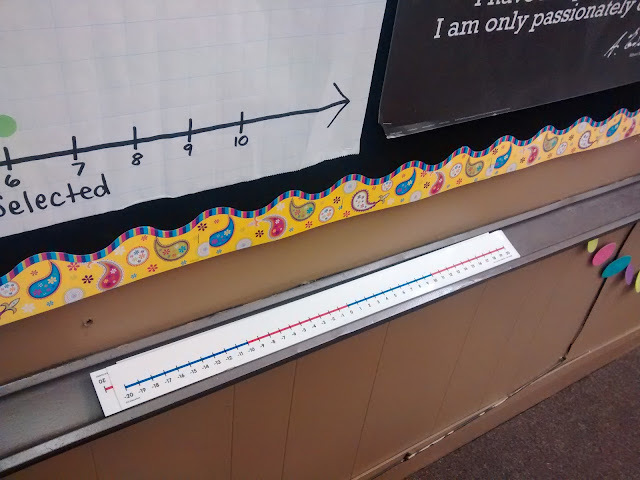 If you're confused, here's a post about the vertical number lines my students glued in last year to help them with slop. Are these notes perfect? Absolutely not. 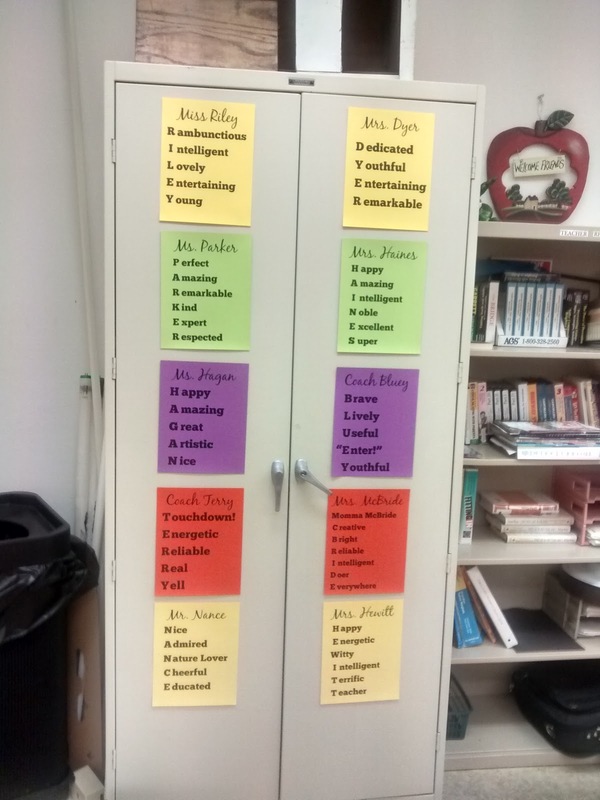 Having had students use them, I see so many ways to possibly make them better. Use your judgment. You know best what your students need. On Tuesdays, Wednesdays, and Thursdays, I set the SMART Board timer for 5 minutes and passed around the flash card bucket. Each bag has 48 flash cards. These 48 problems were taken from the 50 question pre-test. Students work through the flash cards while referencing their notes sheet. Students with number lines should use the number line and chip to act out each question. 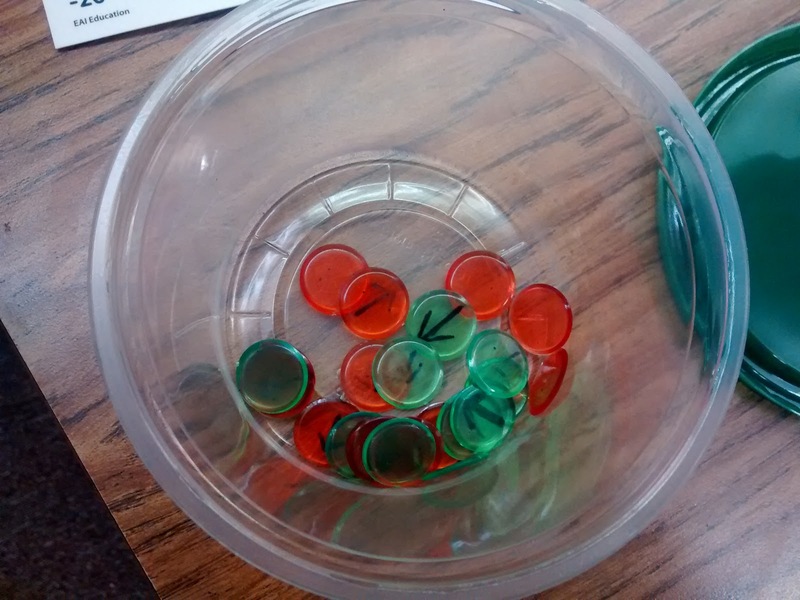 As students gained confidence, they only used the manipulatives on questions they struggled with. I blogged more about these flash cards and how I made them here. On Fridays, students took the pre-test again as a check-up. 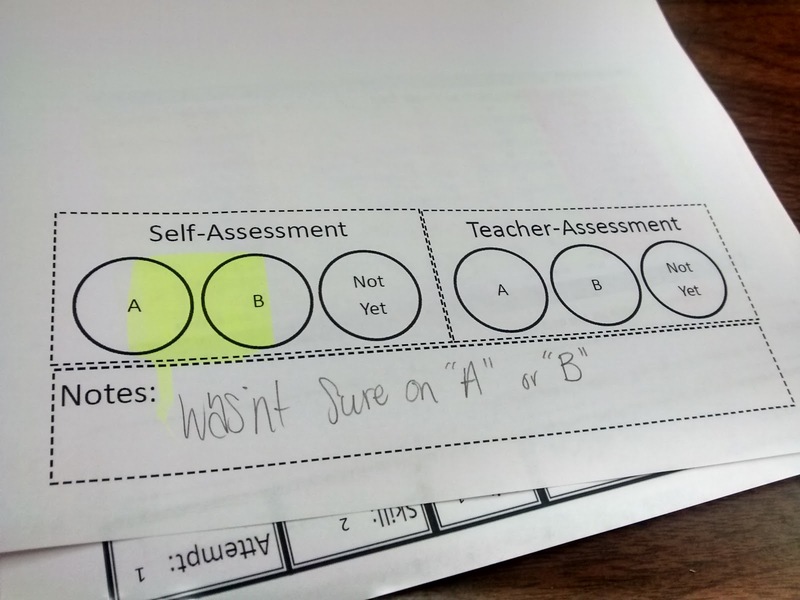 Tests were graded. Scores were recorded. On Mondays, students got their tests back to correct. Students used their notes to rework any questions they got wrong, and they used the rest of their daily 5 minutes to complete any problems they didn't get to. After doing this for three weeks, I wrote a post-test for students to take. Students took the regular test on a Friday. On Monday, I gave them a test with new questions. The purpose of this was to ensure that students had not somehow memorized the 50 answers to the pre-test/weekly check-up test/flash cards. I told them if they had memorized the answers to all 50 questions in order, I would be very impressed! I graded Friday's test and Monday's test and put the grades in my excel file. I was a bit disappointed in how little detail students used in answering the last two questions. :( I was hoping I'd be able to pull some good quotes from there to use for my research project! So, I've got all my data compiled now to determine if the use of manipulatives increases the effectiveness of remediation of integer operations as compared to rotely memorizing rules. One of my classes focuses on how to analyze this data. I could try to start it on my own now, but I've got enough other stuff on my plate. I found it interesting that none of my students seemed happy about what group they got placed in. 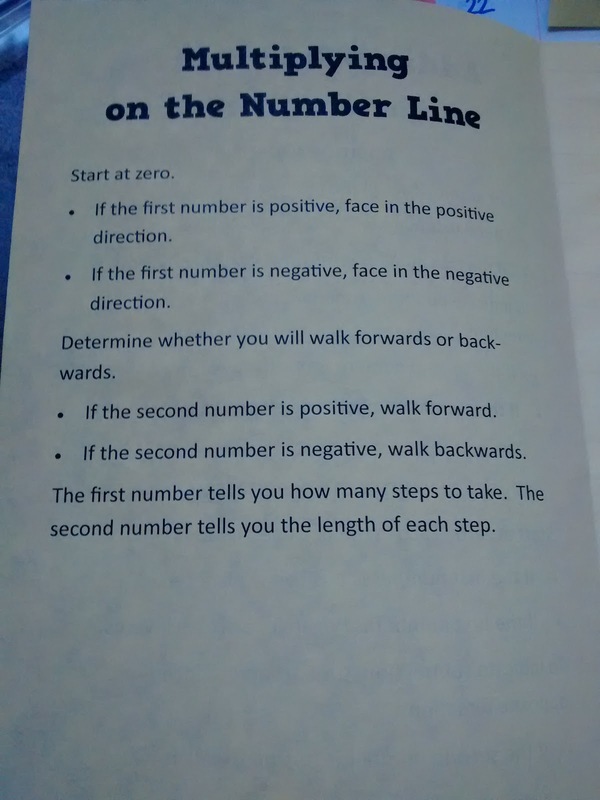 The students with number lines thought they were dumb and annoying. The students without number lines felt cheated. 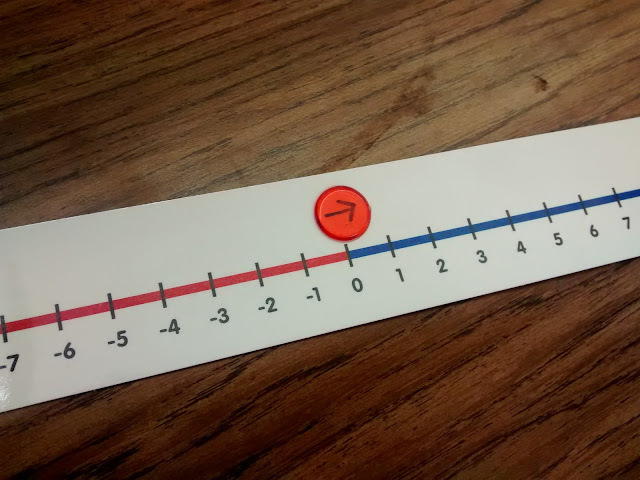 It absolutely broke my heart when I heard a student claim that I had only given him a number line because he was a special education student. I want my students to see a number line as a tool that they should all be using. Many of my students who weren't in the group that received the number line instructions still made use of the number line on the wall on occasion. They asked if this was okay. Absolutely! My project just dictates what instructions I give you. They were welcome to solve the problems in whatever way they chose. Oh, and I guess I should specify this: scores went up! In both groups. I'll update you after performing further analysis. In other news, only 4 more classes left of my master's program! WODB: Which One Doesn't Belong?